Shea Velloso is a concert organist from central New Jersey. He is a graduate of Mason Gross School of the Arts where he earned his bachelor's degree in organ performance. Shea's teachers have included Antonius Bittmann, Mark Trautman and Paul Hoffman. He has pursued post-graduation studies with critically acclaimed organists Paul-Martin Maki and Gordon Turk. In 2004, Mr. Velloso was the recipient of The Elizabeth W. Durham Award for Excellence in Performance. He has performed recitals throughout New Jersey and New York City. He has appeared in concert on the national public radio show "Pipedreams" and on Metuchen Television. 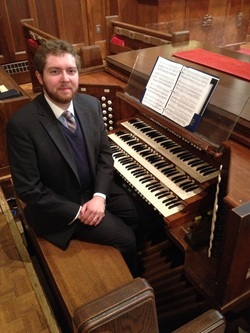 As Director of Music at United Methodist Church at Milltown, he is the organist, director of the church's three choirs and is responsible for planning the church's concert series and Music & Meditation for Lent series. He is currently in the midst of leading a fund-raising project which will finance the installation of the church's new pipe organ. Shea previously served as Director of Music at the Presbyterian Church of Jamesburg. In addition to his job at the Methodist Church, Velloso also serves as the High Holy Day organist at Anshe Emeth Memorial Temple and as accompanist for Philomusica Choir. During the summer months, Shea enjoys working as an accompanist and rehearsal leader for the Ocean Grove Camp Meeting Association. He is also a past Dean of the American Guild of Organists: Middlesex Chapter. Most recently, Shea has joined the newly-founded Collegium Musicum​ of Old Bridge, in central New Jersey.